Sini Coreth thinks all the time about new ways to include the visitors in her work. 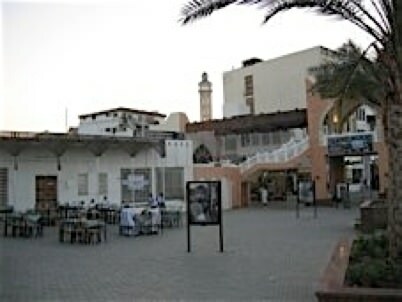 At the main-entrance of Mathra Souq she installed a big video-screen on which the video “on the way to… was projected. 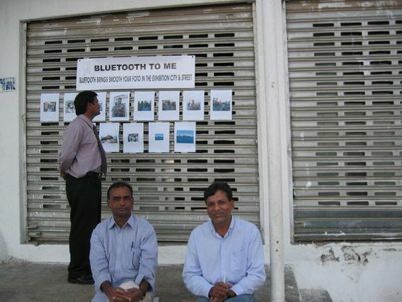 She installed a desk in the street with a computer and printer and asked the curious passing by people to shoot some photos on their mobile and than send them by bluetooth to her computer. She printed them out, let sign the photos by the photographer and made the exhibition “Bluetooth to me” in the street within the exhibition “THE CITY & THE STREET” (see photos). This event and installation became an important place, she was surrounded by curious people and by street photographers which wanted to send her the photos.